Marlon Brando: The actor's little black book. Marlon Brando dropped this battered address book on the stage of New York’s Barrymore Theatre while appearing in A Streetcar Named Desire in 1949. Sadly for latter-day snoops, Brando mostly stuck to first names in recording his contacts (“Janice,” “Sandra,” “Kay”). Notables listed by both first and last name include Ellen Adler (famed acting teacher Stella’s daughter and Brando’s sometime girlfriend) and “Jimmy Baldwin” (the writer James Baldwin, who was Brando’s longtime friend). The play’s production manager, Robert Downing, picked the book up off the stage and—for reasons lost to history—kept it, despite Brando’s desperate note. The book ended up at the University of Texas at Austin’s Harry Ransom Center with the rest of Downing’s papers. Thanks to Helen Baer and Jennifer Tisdale of the Harry Ransom Center. 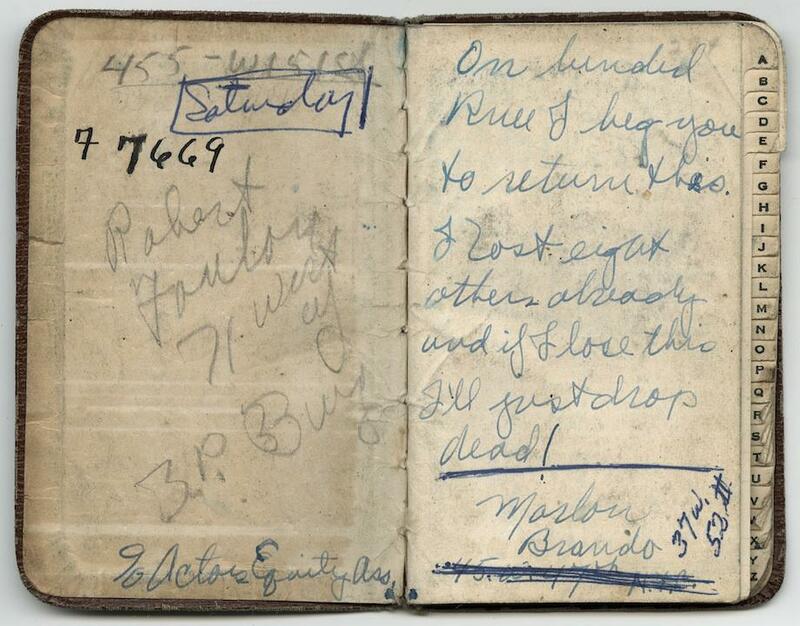 Marlon Brando’s address book “dropped on the stage of the Barrymore Theatre, NYC, during the run of A Streetcar Named Desire,” 1949. Image courtesy of the Harry Ransom Center.